Onsite Refurbishment Defined « PROTEK Onsite. Overnight. Onsite Refurbishment Costs Less Than Alternatives, AND Takes Much Less Time! 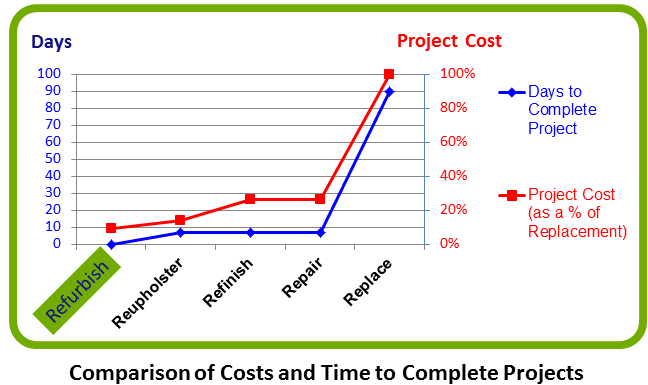 When considering potential alternatives, review the graph above to see a high-level Cost and Time-to-Complete comparison. This chart shows how typical scenarios will likely compare. Costs are relative to the replacement cost. The project timeline reflects the number of days a facility is likely to be disrupted by each service. Since furnishings and the damage associated with each unit will be unique, exact costs and project timelines will vary. According to www.thefreedictionary.com, refurbish is defined as: “to make clean, bright, or fresh again”. As used herein, refurbishing goes beyond simple touch-up. Refurbishing wood includes deep cleaning, removing scratches, nicks, gouges, discoloration, and preservation with specialized oils. Conditioning leather maintains its suppleness to prevent drying and cracking. And upholstered fabrics require deep cleaning and sanitizing. The end result takes your old and makes it like new, or takes your new and keeps it new. To remove all coatings from the surface and then put on a new coating. Refinishing typically includes removing the surface, as well as any coating, and making color corrections and/or color additions. To take something that is damaged, broken, or not working correctly, and return it back to good working condition. Additionally, repair typically includes color correction. Reupholster with new materials, either upholstered fabrics or leathers. Reupholstering may include new foam and extensive work on the frames.